Crop the Mop – Buzz the Fuzz will become a yearly campaign, with the concept following on from similar lines in which the Northern Hemisphere Lyme community joined forces to raise awareness of the dangers of ticks and the pathogens they carry in May, which is their last month of Spring. Similarly, this campaign will raise awareness in time for summer in the Southern Hemisphere, and aims to educate the wider community that ticks become more active in summer time, and to be aware of the health issues that may follow after a tick bite. The Inaugural Campaign for Crop The Mop is 30th November, 2016. Background information and further Aims of Crop The Mop can be seen below, alternatively, The Media Release for this campaign can be seen by clicking here. The date of November 30th 2016 was chosen to launch the inaugural campaign as it is a significant one in Australia this year. On this date the final report of the Australian Government Senate Inquiry regarding the ‘Growing evidence of an emerging tick-borne disease that causes a Lyme like illness for many Australian patients’ is due to be released. “We are hoping that the only thing being swept away on November 30th is hair, and not the need for funding and research into this Vector Borne Illness that is debilitating thousands of people in Australia and around the world.” Crop the Mop organiser Karen Smith said. On November 30th 2016, GLilO founders Karen Smith (Australia) and Lisa Hilton (USA) will launch the inaugural campaign by each 'cropping' approximately 40cm of their hair. Once cropped, they will be donating their hair for wigs. Lisa's hair is going to a Cancer organisation in America and Karen's hair will be sent to an Alopecia organisation in Australia. While the added bonus in this Inaugural campaign is that both founders of GLiIO have hair long enough to be able to donate for wig making, the primary aims of Crop the Mop are to raise awareness of Lyme & Vector Borne Illness; raise funds for projects that GLiIO undertakes; and to help people raise funds for patient care / treatment. The Lyme community was asked to join in helping make the campaign a success by either, sharing the campaign and spreading awareness, cropping their own mop, or donating funds. Having no hair to ‘crop’, Australian Lyme patient, Nurk Daddo, added the ‘Buzz the Fuzz’ component to the campaign, “For any blokes that want to get involved, where, like myself, cranial hirsuteness may be an issue, I've come up with Buzz the Fuzz - I'm going to join in by shaving off my beard - facial fuzz that has been my friend for 40 years”, he said. Videos will be taken of each ‘Crop the Mop’ and ‘Buzz the Fuzz’ and shared on Global Lyme & Invisible Illness Facebook Page. The date of November 30th was chosen for the Inaugural 'Crop The Mop' campaign in order to bring awareness to the fact that on this date the final report for the Senate Inquiry regarding Lyme in Australia is due to be released. As the campaign message notes - we hope to ensure that the only thing being swept away on November 30th is hair, and not the need for funding and research into Vector Borne Illness. In the coming years, we will put a call out for participants in September (first month of Spring), to allow 2 months to raise awareness before 'Cropping' hair, or Buzzing the beard in November. 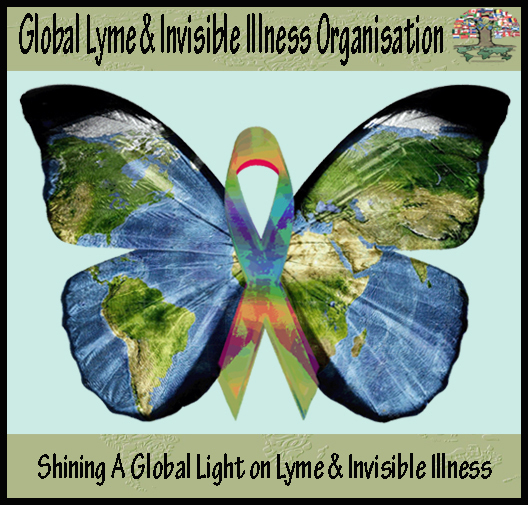 Global Lyme & Invisible Illness Projects include: Red Shoe Day: A Day of Remembrance, Holiday Seasons, Global May Project - Raising awareness and connecting patients around the world. If other people would like to join in and 'crop their mop', please contact GLiIO and we will put up an individual fundraiser page for you. Half the money you raise will go to GLiIO, while the other half will go to yourself (or a person you nominate) for care /treatment. “Being involved with the Lyme community for a number of years, we are very aware of the fact that many people struggle with treatment and everyday living costs. We wanted to be able to give back to the people in the community who are constantly raising awareness and helping others, by offering a way to raise some extra funds of their own" Karen and Lisa said.